I have been SO bad about cooking lately. Ever since we did a Whole 30 (whole 25?) back in May I have been burned out on cooking. I can do good for a week or two but then I just fall off the bandwagon and want to eat out for every meal. Our stomachs and wallet do not agree with it, so I wanted to try something different. 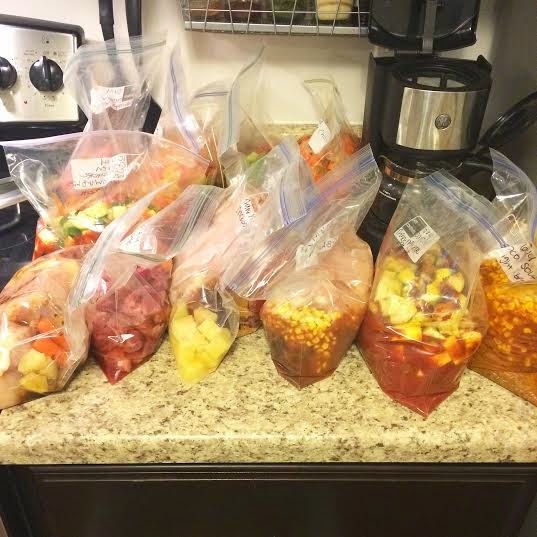 I have always wanted to do freezer meals, but never wanted to put in the time to do a whole months worth, so the other day I just randomly thought I'd try to come up with meals for 2 weeks and then if it goes well, I'll do it again in 2 weeks and just keep doing it every couple weeks. I grocery shopped for 13 dinners as well as our staples, breakfast stuff, etc. and I will plan to go back next week just for produce and milk. We can't make it 2 weeks for produce...it always goes bad before then and my kids would go crazy without bananas and grapes (I would, too). So I think this will work out pretty well for us...hopefully! Here is what I made. I will link to the recipe if it is available! A good majority of them are Paleo. I don't think any of them have dairy in them. They are almost all either a crock pot dish or a soup...it is just that time of year and they are easy. It took me just 2 hours to get this all ready, so I figure that will probably save me about 10 hours of dinner prep time over the next couple weeks!! My freezer is PACKED full and I am really, really hoping this will keep us on track for saving money and eating healthy!! Do you have any other freezer meals you love?! Such a great idea! Thanks for posting. My boys can't live without strawberries, bananas, and blueberries! Haha.